The Chevrolet Bolt EV electric car notched 350 sales, just short of its October record of 371. It still outsold the conventional Prius Liftback, which achieved 316 units. 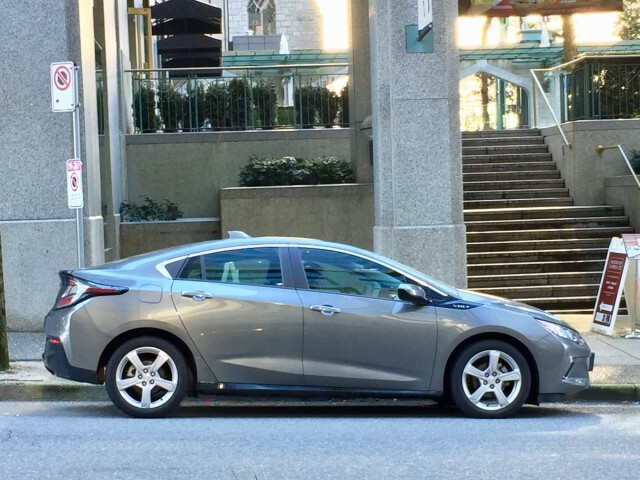 On a population-adjusted basis, Bolt EV sales in Canada are roughly in line with U.S. figures, while in recent months, the Volt has been three times as popular north of the 49th parallel as it has in the U.S.
Volkswagen sold 128 e-Golfs in Canada in November, its best month to date, while Toyota sold 107 Prius Primes in Quebec. As in the U.S., Nissan continued its drawdown of first-generation Nissan Leaf electric cars, selling only 5 units. While efforts have been made to estimate sales for each of the following vehicles based on partial registration data, as usual Ford C-Max Energi, Ford Fusion Energi and Hyundai Sonata PHEV sales were not provided by their makers. As a Ford representative said years ago: "I have looked into this and unfortunately we are not inclined to provide this level of detail for Canada. The numbers are very small, as you might imagine." 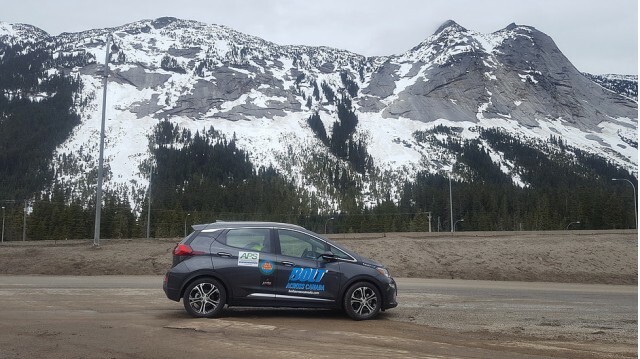 However, the recent acquisition of Quebec rebate data by l’Association de Vehicules Electrique du Quebec and rebate information from British Columbia produced a significant upwards revision in estimated Ford C-Max Energi and Fusion Energi sales during recent months. The increase is consistent with a well-documented increase in sales of the Ford Focus Electric. 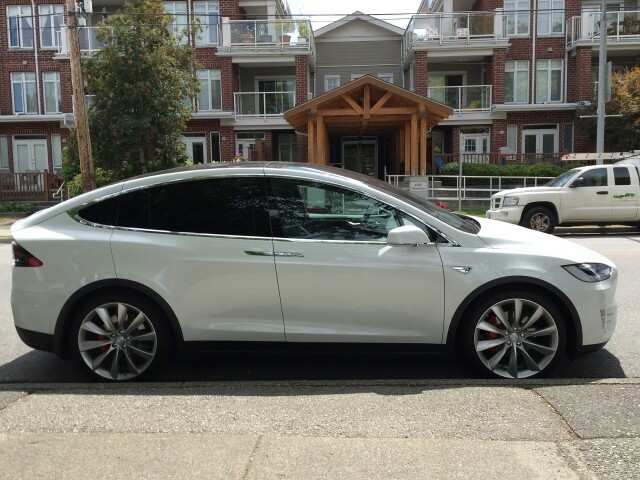 As a result, plug-in electric vehicles are now estimated to have represented 1.25-percent share of Canada's new-car market in September. Despite not benefiting from an end-of-quarter “Tesla tailwind”, October’s plug-in electric vehicle market appears to have narrowly beaten September’s, coming in at 1.28 percent of all vehicle sales. Though estimated sales declined month-over-month to 2,102 from September’s 2,336, they dropped by a lesser percentage than the overall market. 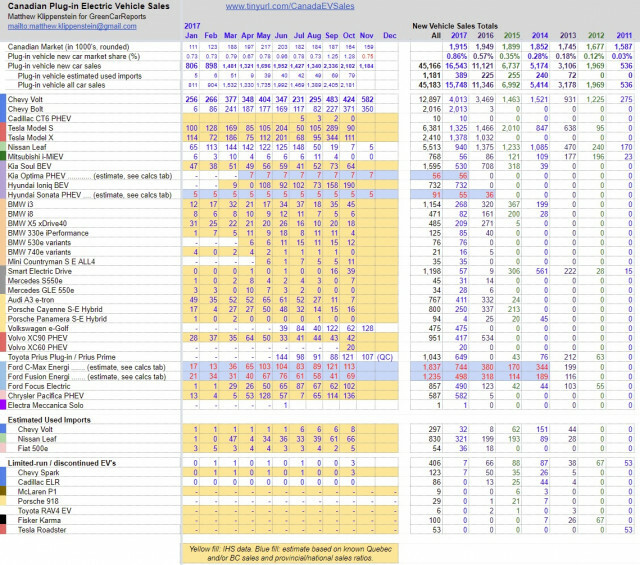 From October registration data, Tesla sold 90 Model Ses, down from 289 in September, though still higher than sales in the prior beginning-of-quarter months of July and April. The company also sold 111 Model Xes, down from 344 in September. The January-through-October sales of the Model S and X, at 1,325 and 1,378 respectively, are almost one to one. Hyundai and Kia continued their successful foray into the Canadian plug-in market, with the Hyundai Ioniq Electric selling 190 units. With Nissan awaits the next-generation Nissan Leaf, the Ioniq looks poised to become Canada’s fifth best-selling plug-in electric vehicle of 2017, below the two Chevy and two Tesla models, after only eight months on the market. Kia sold 64 Soul EVs, and about a half-dozen Hyundai Sonata and Kia Optima PHEVs were likely sold in October. Chrysler sold 136 Pacifica Hybrid minivans in October, while Ford sold 102 Focus Electrics. Among luxury brands, Audi sold 7 A3 e-trons, while Porsche sold 16 Cayenne S-E Hybrids. Daimler sold 39 Smart Electric Drives and 7 Mercedes S550e sedans. For its part BMW sold 45 i3 hatchbacks, 6 i8 coupes, 18 X5 xDrive40 SUVs, 4 330e and 12 530e plug-in hybrid sedans, as well as 11 Mini Countryman S E ALL4 plug-in hybrids. Finally, Volvo sold 42 XC90 PHEV SUVs, and launched the XC60 plug-in hybrid in Canada to 20 sales. The apparent health of the plug-in segment has stoked the hopes of Canada’s electric-car advocates that sales of plug-in cars could reach 2 percent in coming months. The best bet for that milestone might be March 2018, as it should benefit from the typical end-of-quarter Tesla tailwind.